Puffy, or Puffy AmiYumi, are a Japanese pop band. They have a very specific sound. If Puffy made anything that sounded quite distinctly different, it would stand out pretty badly. Himitsuno Gimmy Cat Ufufu Hontouyo is a one-track single that is not even the slightest similar to anything else Puffy has ever done. Not one part of their classic sound or poor English pronunciation is here. 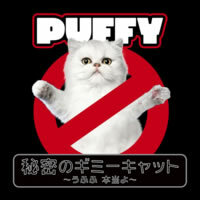 Is this the same Puffy!? Oh wait, I guess the song does have the trademark 'Hey!' calls that Puffy practically invented. This song is all over the place. Part of it is in Send-Up Country, another chunk resides in the Kentish county of "Why are there cash register sound effects?". Why is the album artwork a parody of the Ghostbusters logo? Explain it to me; I want it explained to me, now! Getting around the pure weirdness on show, and the singing style, I can actually appreciate this from a musical standpoint. Sure, it's bizarre, but it still follows generic song structure and has a really catchy chorus. The infectious "Gimmy Chance" in the chorus serves a dangerous earworm, and the bouncy baseline in the verse really gives off a cartoon show feeling. It's just wacky. "Lesson 1! Un, Deux, Trois, CAT!" Catchy and, before I realize it, I could have been listening to the song three or four times on loop. I first discovered Gimmy Cat on Spotify, but immediately after listening to it I purchased the digital single from Amazon. I personally enjoy this song quite a bit, but I hope this song is merely a phase. Despite liking this song a lot, I think the traditional Puffy sound is much better! It is nice to see Puffy continuing to create, and I appreciate the sheer cajones on show by taking on a crazy style. But it just isn't "Puffy" to me.